MMA Lighting Consultancy is a specialist exterior lighting consultancy who have experience in a range of sports pitch lighting designs for clients throughout the UK. Exterior lighting can be required on a range of venues ranging from Cricket, Football, Tennis, Equestrian – to name but a few. As a general rule, fast action sports (such as cricket, baseball, hockey etc) will require higher lighting levels due to the small playing object travelling at high speeds, such as Rugby, Football, equestrian etc will require lower lighting levels. The lighting levels for sports pitch lighting will also vary depending on the type of activity, this can range from club, professional and up to tv covered sporting events. Lighting levels are covered by the European Standards BS EN 12193 with a number of sports having their own lighting document governing the levels, such as the lawn tennis association. Most sports require high levels of uniformity to ensure and even and consistent spread of lighting, plus a white light source, such as an LED or metal halide lamp is often suggested. At MMA Lighting Consultancy we have experience in carrying out lighting designs for a considerable amount of sporting venues and most recently have completed lighting designs for a Tennis Club and Equestrian centre. 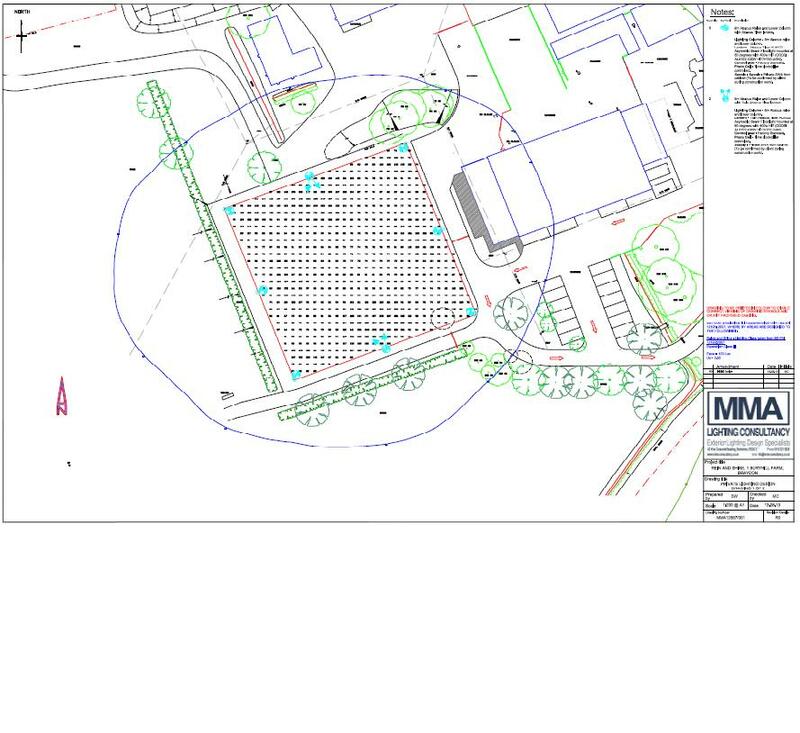 At MMA Lighting Consultancy we are able to offer a one stop shop, in so much that we can produce sports pitch lighting designs, sports lighting impact assessments and design the private cable electricity supply network to the lighting units. We carry out detailed lighting designs in accordance with BS EN 12193 or for planning applications to enable to client to obtain planning consent for their development. We are also able to produce isolator contour plans showing the spill lighting falling onto sensitive receptors and demonstrate obtrusive lighting calculations at specific points.